Dr. DiCosmo was awarded his medical degree from the University of Connecticut School of Medicine. He completed his internship and residency in internal medicine at the University of Connecticut Health Center, followed by a fellowship in pulmonary medicine, critical care and sleep medicine at the Yale University School of Medicine. He is board certified in internal medicine, pulmonary medicine, sleep medicine and critical care by The American Board of Internal Medicine. Dr. DiCosmo is the director of the Westmed Sleep Center and associate medical director of the sleep lab at White Plains Hospital. 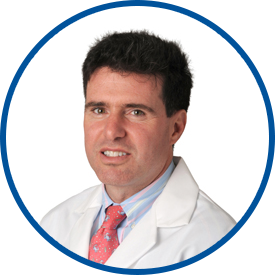 He is affiliated with White Plains Hospital and Greenwich Hospital, and is the director of pulmonary rehabilitation at Greenwich Woods Rehabilitation Center. He is an assistant clinical professor of medicine at Cornell University School of Medicine as well as at Yale University School of Medicine. He is a Fellow of the American College of Chest Physicians and a member of the American Thoracic Society. Dr. DiCosmo joined Westmed Medical Group in 2001. He has three children, Alyssa, Michael and Sarah. Dr.Dicosmo is wonderful doctor and his care for his patients is amazing. *Dr. DiCosmo is terrific! He's the BEST! Dr Dicosmo is the best. he always explains things in a way that I can understand and he is always smiling! I could not be happier with this provider. Dr. Dicosmo has proven to be a really special and caring doctor who has a great sensitivity to my needs and is always in a great mood which helps to reduce my medical concerns. Dr. Di Cosmo is the best! I have the utmost confidence in Dr. DiCosmo. Dr. DiCosmo is my primary care physician for last 8 to 10 years. He is excellent, explains everything, very courteous and we even have a few laughs. All good on this visit. Professional and courteous. I would recommend *Dr. D. to anyone and have done so.